Ah, the start of a new year – a clean slate with endless possibilities. 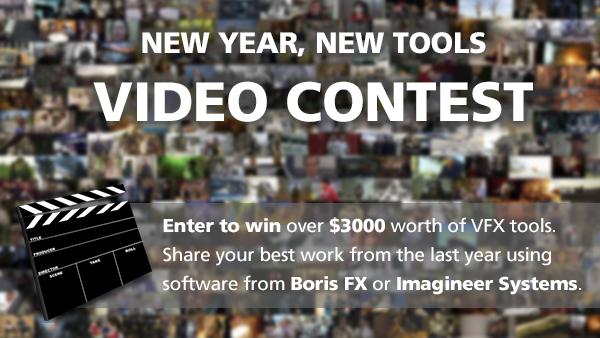 To kick off 2015 Boris FX and Imagineer Systems are sponsoring a quick and easy video contest! Share any project completed in the last year that used our software and be entered to win over $3000 worth of vfx software tools. 5 winners will be randomly picked from the entries. Contest open to all, professionals, independents and students. Enter as many times as you want! 1. Upload any creative project completed in the last year to Vimeo.com. Project must have used BCC, mocha (or other software* from Boris FX or Imagineer). 2. Tag your video: " Boris FX + mocha 2015 "
3. Tag what products you used: "BCC", "Red", "mocha AE", "mocha Pro"
Winners will be notified via email and be featured on www.borisfx.com + www.imagineersystem.com . Good luck! Fingers crossed you'll be the lucky winner of some shiny new vfx tools! * Contest open to any user of Boris FX software including: BCC, Red, Graffiti, Avid FX, etc. * Contest open to any user of Imagineer Systems software including: mocha AE, mocha Plus, mocha Pro, mocha HitFilm, etc.